Once you’ve selected the sofas and chairs for your living room, there is one piece of furniture that can pull the whole room together instantly – the coffee table. Coffee tables used to be a place to put your drink or place a book, but it today’s interiors they are often the focal point of the living room. At The Wooden Furniture Store we have tips to choose the perfect coffee table to suit your living room and our pick of the top styles. Choosing the correct size and shape coffee table is very important, so that it works in harmony with the rest of your living room furniture. Too small and the coffee table will look odd and impractical. Too large, and it will look out of place. The coffee table should be ¾ of the length of your sofa so it doesn’t dwarf it. You should also allow plenty of space to walk round the coffee table otherwise the room will be cramped. Think about the height of the coffee table. A low table will make it awkward to serve refreshments and one that’s too high might interfere with television viewing! It might sound obvious, but pick a coffee table design that works with the rest of your living room furniture scheme. If your living room is a tradition style what about our La Roque mahogany coffee table with drawers? This coffee table is a beautiful, classic design with hand carved fluted legs and decorative side panels. The table is finished with a hardwearing mid gloss lacquer to highlight the natural beauty of the mahogany. See the La Roque living room range here. If you have pieces of wooden furniture already in the living room choose a coffee table to match or opt for a table that’s a neutral white painted wood. Why not look at our Vermont 4 drawer coffee table? The table features great storage with a large open shelf and four large drawers. It’s made from solid ash that has been treated with a seven step paint process to ensure a fresh but durable finish. What will the coffee table be used for? Stacks of books make a stylish display on a coffee table and create a focal point in the living room. If this is your plan, then a wide low table is the best option like our premium Atlas large coffee table. This table would make a contemporary centre-piece for any living room. The clean styling is emphasized with a subtle polish which accentuates the natural appeal of the wood. 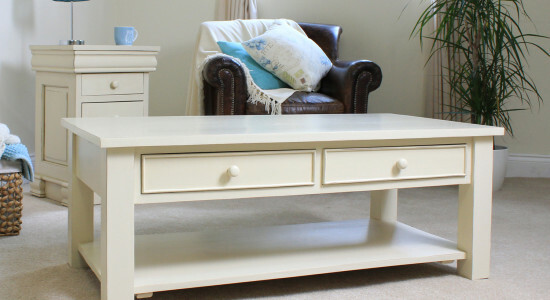 A coffee table is ideal for storing unsightly clutter such as TV remotes, magazines and newspapers. Choose a style with plenty of drawers and shelves like our stunning Shiro Walnut 4 drawer coffee table with drawers. This coffee table is made from high quality solid walnut which has a dense grain making it perfect for living room furniture. It’s been finished with a resilient satin lacquer to ensure that it’s hard wearing and each drawer has a stylish bronze handle. See other items in the Shiro Walnut living room furniture here. If you’re using the coffee table to serve refreshments and snacks then you’ll need one that’s a robust design with a sturdy surface like our Mayan Walnut open coffee table. This is another beautiful table made from solid high quality walnut and featuring an open shelf. The Mayan Walnut living room range can be viewed here. What-ever style you choose for your living room remember that all of our furniture is delivered fully assembled within 10 days.